That's right. Is either you pay for the right (ie license, copywrite) otherwise illegal. May be wait for it to be finalised. Now too early to say. Anyone can share their expoernece about TV box? Is to good to really have at home? Get Mi Box S and the cast from your mobile phone (iPhone or Android) using the built-in Chromecast function of Mi Box S.
This is one of the best solution for Toggle and Starhub Go. No easy solution for TVB Anywhere SG which does not support ChromeCast and it is known to be incompatible with Android TV device like Mi Box S and Nvidia Shield TV. As per the FAQ, it is meant for mobile phone only. Last edited by xiaofan; 20-01-2019 at 04:11 PM.. It all depends on your needs. You may not need one if you have already have things like a Smart TV or Google Chromecast or Apple TV. And you may still need to pay for the content providers like Netflix. Last edited by xiaofan; 20-01-2019 at 11:53 AM..
How about this model? Was at AMK HUB. the proposed act is targeting at this company and other similar companies. most likely you can get boxes with similar or better spec at 1/3 the price from online store, such as lazada, qoo10 or geekbuying. Thanks for the information. Seems like something along the lines of Mi Box S might be better for the scope. Right now it is business as usual for the three kiosks in Jurong Point. Business is so so for the one selling Geekbox only and the other two kiosks got more business selling other accessories than TV boxes. One of them is selling T96 Mars box with preloaded apps for S$150 and other is selling Mele boxes with preloaded apps. So far it seems to me only the Mele boxes got some attentions occasionally. Even without the ban in place yet, just considering the high rental cost in Jurong Point, I will say the one selling Geekbox can not be sustained. Then the one selling T96 Mars and accessories may not survive long either since it get zero interested customer for the box and few customers for the accessories. The one selling Mele might survive since it does get some business from the accessories. But then the business of other kiosks selling cases and screen protectors and other accessories seem to have better business. Last edited by xiaofan; 20-01-2019 at 02:23 PM.. Some interesting perspective why people choose to go for the pirate streaming apps. "you should note that the cord cutting ecosystem is still very weak in Singapore, compared to places like the US. there're very limited legal avenues for subscription streaming services. there's netflix, starhub go, singtel cast, viu, tvb anywhere and toggle. many people use vpn services to subscribe to US/UK based content, or just view pirated streams." Good read. Informative, but correct me if I’m wrong, I read somewhere to use the Starhub TV box, you have to subscribe to their Starhub Fibre broadband too? Last edited by Elon Jobs; 20-01-2019 at 06:47 PM..
Good read. Informative, but correct me if I’m wrong, I read somewhere to use the Starhub TV box, you have to subscribe to their Starhub Fibra broadband too? 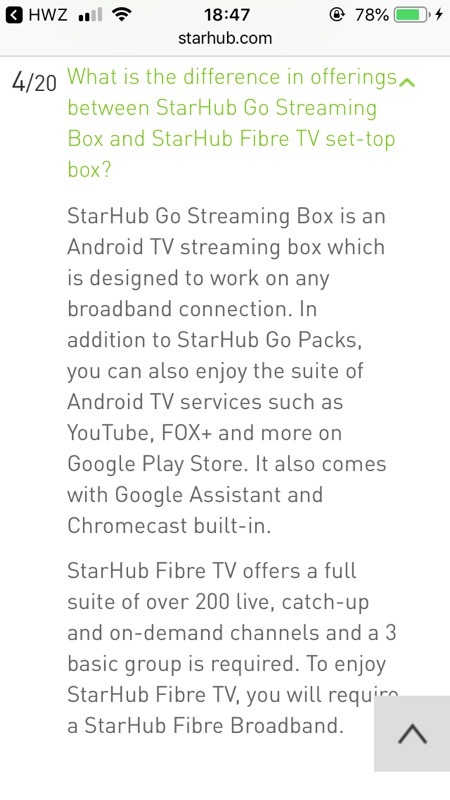 For Starhub Go Streaming Box, you do not need to subscribe to their fibre internet services. Thanks lor clarifying. I got the two boxes mixed up. Do you think such kiosks will close down after the law is out? Yes since the law will ban the sales of preloaded boxes. They will have to sell bare boxes and then they will not be able to compete with online shops selling bare boxes. In the end the number of physical shops selling Android TV boxes will go down a lot if not completely disappeared. Last edited by xiaofan; 21-01-2019 at 07:40 AM..